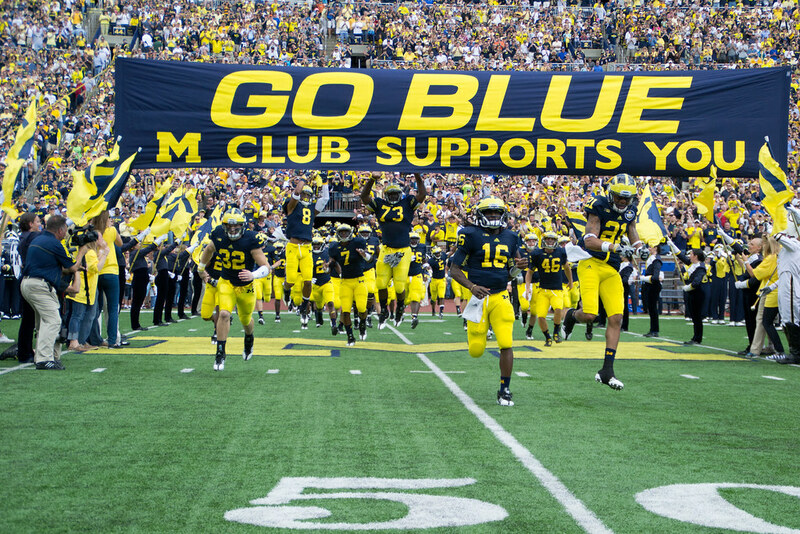 The Go Blue banner will be a very welcome sight in 2013. Last year, when we did our look ahead, the 2012 schedule seemed daunting, but somehow manageable compared to how it eventually played out. We knew it would be a grind with so many tough road games...but 2012 was simply a brutal schedule. Brutal because, like 2011, this Michigan team was not ready to compete against superior talent in hostile environments. Not yet. All 5 losses took place away from the Big House, against top 10 teams (sans Nebraska) in high-profile, very visible, often primetime games. It illustrated the fact that, despite an 11-2 season in 2011, Michigan was not "back" yet. Being "back" means that you win most of those tough road games. When it was all said and done, the combined record of teams that beat Michigan was 57-6. That said, the combined record of teams Michigan beat was 42-59. That's not "back". A year ago at this time, we had no idea that Notre Dame would go undefeated and play for a national championship. We had no idea Nebraska would make it to the Big Ten title game. We knew Ohio State would have to spend New Years at home while the rest of us got to enjoy the post-season, but we had no idea they would be 12-0 while they did it. And of course, Alabama was just as good as advertised. Team 133 had maybe one of the toughest schedules in the country. Thankfully, mercifully, 2012 is so over. Team 134 will still be playing a respectably difficult schedule, but it's much more manageable with more big games at home, and a not starting the season against an NFL squad. Hit the break to dive in. Well, there's no season opener against Alabama, so we're already off to a good start. The 2013 opener against Central Michigan should immediately provide Michigan with a solid start to the season. No worries there. On the following week, however, is when the fun really starts. The Irish, likely a top 10 team, will come into the Big House for another primetime kickoff that will either make or break the season for either team, as it often does. Michigan had their shot at beating the Domers in South Bend at night last season, and tossed the game away in unbelievably heart-breaking fashion. I suspect Michigan and Notre Dame should matchup pretty well, as they normally do, to provide us with yet another memorable game in this series which will be ending in 2014. Taking a page from the Ohio State non-conference scheduling regimen, week 3 brings the mighty Akron Zips to the Big House for another B1G --$$--> MAC game. Then, Michigan rounds out the non-conf schedule with a roadtrip to East Hartford, CT to pay the UConn Huskies a return visit for their trip to Ann Arbor back in 2010. It's been widely publicized that Dave Brandon has been chatting with the UConn administration in attempts to woo this game to a neutral east coast venue, such as Gillette Stadium, home of the New England Patriots. His efforts have been unsuccessful. The interesting bit here is that UConn's AD, Warde Manuel, played football at Michigan from 1986-89, and he was a former UM associate AD. Despite that, his stance is to keep the game at his house, Rentschler Field, (capacity 40,000). Manuel told the Hartford Courant “we have a contract to play at Rentschler Field and that’s where we’re gonna play”. This game seems far too important to UConn to want to play it anywhere but their place. Even a bigger paycheck from playing at Gillette doesn't seem to be a factor. Whatever. Toughest legends division game? Probably Northwestern. With Mark and Coulter coming back, and the fact that it'll probably a night game on the road, that could spell trouble for Michigan. They struggled to beat NU last season, and probably shouldn't have. Evanston isn't the toughest venue, especially since it's a very Michigan-friendly crowd with so many alums in the Chicagoland area, but Northwestern always plays well there. Other than that, Nebraska is the key to a sweeping the division. Thankfully they'll be visiting the Big House this season. The winner of this game goes to Indy. Mark it dude. Michigan State is always a tough game when played in E. Lansing. But a 7-6 team from 2012 is about to lose their 3 best players (early) to the NFL. That's just unfortunate for them. 2013 might be a struggle to maintain bowl eligibility. That said, no one will ever overlook Sparty while they have Dantonio...especially on the road. Iowa is Michigan's last regular season road game. Please let Iowa be good enough so we're not looking past them to an 11-0 Ohio State team. Thx. Ah yes, time for Illinois and Purdue to rotate off the schedule. Indiana and Penn State take their place, which is fine by me. Indiana is a win, I'm calling that one right here. I can't wait to go to Happy Valley on October 12th. Michigan at Penn State will be a big TV draw. Could end up being a night game. In fact, I can almost guarantee it. And then of course, the game. The 2013 finale at the Big House. Right now in early January, this date is already being circled on the calendar by both teams. It's entirely likely that one or possibly both teams could be 11-0 when this game is played. I'm not saying it's the return of the "Big 2 and the little 8, 10, 12", but its sorta feels like it. I swear my right heel was tapping very quickly when I typed that last paragraph. I might need to be sedated if this actually happens. Illinois, Purdue and Wisconsin should all be non-factors now that Ohio State is post-season eligible again. From a Michigan perspective, it doesn't really matter that we don't play these schools. Ohio State is the only shark in that tank. Coming up next, we take a look ahead to the 2013 defense. Stay tuned.